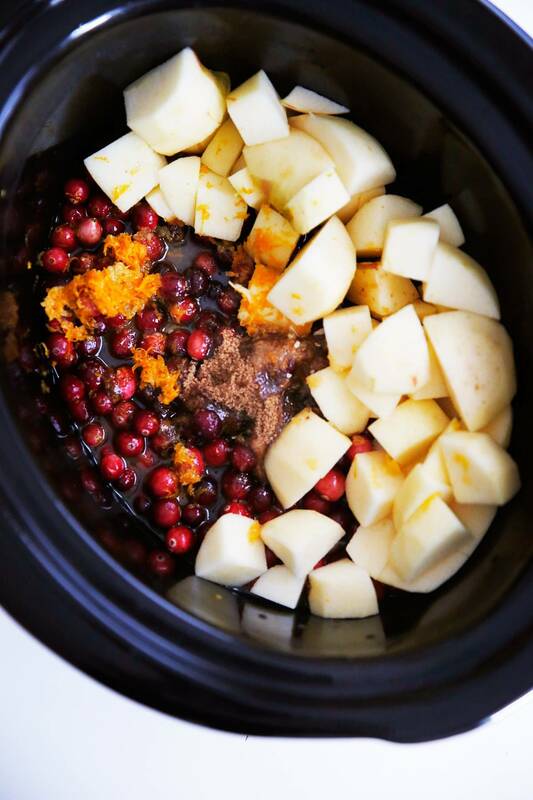 This Crock Pot Cranberry Sauce is an easy update on the classic Thanksgiving staple! It is such a great combination with tart cranberries, along with sweet apples and just the right amount of citrus. It’s made right in the slow cooker which means hands-off cooking so you can focus on other aspects of your holiday meal! It contains no refined sugars and is bound to be a new family favorite! 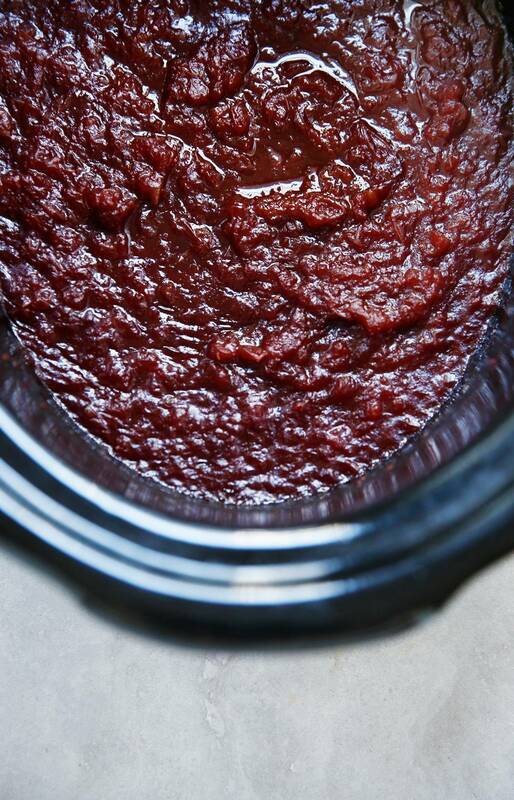 Forget the over sweetened canned cranberry sauce this year because it is SO EASY to make this Crock Pot Cranberry Sauce! You essentially throw all the ingredients in your slow cooker and walk away! It also is refined sugar free relying on coconut sugar, honey and sweet apples to balance the tart cranberries and citrus. This sauce is of course well known as a Thanksgiving staple, but I also love to put a spoonful right on top of of latkes or as a versatile spread for breakfast or leftovers! How do you sweeten homemade cranberry sauce? We used a combination of naturally sweet apples, orange juice, honey and coconut sugar! How long does homemade cranberry sauce last? Homemade cranberry sauce will last quite a while, so this makes it a great make-ahead part of your holiday feast! We’d recommend using it within 7-10 days after making for optimal freshness, but it could very well last longer. For Thanksgiving it might make sense to make the cranberry sauce a few days ahead of time! You can serve it cold or you can re-heat gently in a pot over low heat. Cook on high for 3 hours. Use a potato masher and mash cranberry/apple sauce. Continue to cook for one more hour with the lid slightly ajar. Serve immediately with a holiday meal, or cool and serve later. Cranberry sauce will last between 7-10 days in the refrigerator. Sweet Potato Latkes with Cranberry Sauce. Genius! Can I come to Thanksgivukkah at your house? This looks delicious! Just in time for Thanksgiving! I love anything that I can just throw in the crockpot. I have made this recipe before using fresh cranberries. It was delish! Can I use frozen cranberries? If so, should I thaw or use frozen? Thanks so much. Delicious!!!! Perfect addition to my Thanksgiving meal. This year is the first year my husband and I are hosting in our new home and I love that I can make it ahead of time. Made this today and it is amazing! You will never miss all that refined sugar. I added pomegranate seeds to mine after it cooled. Can’t wait for Thanksgiving! Thank you Lexi! 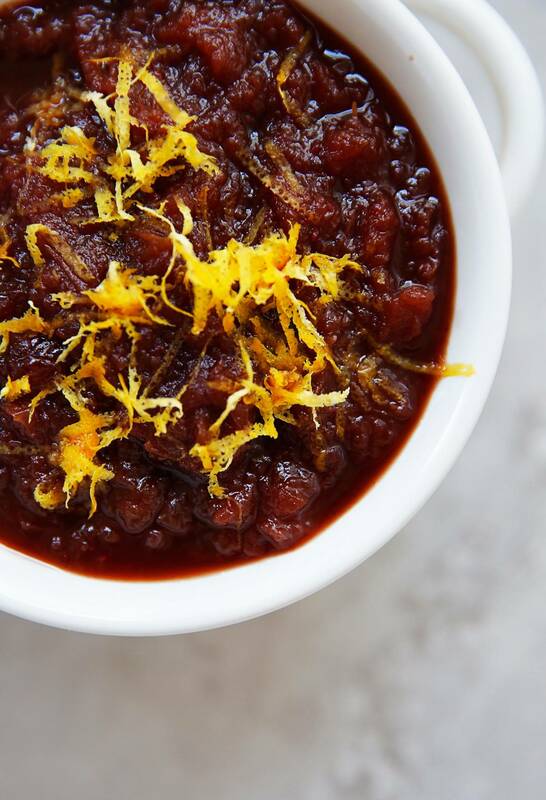 Oh my goodness, this is the best cranberry sauce ever! I just made it, and cant stop licking the spoon. Thank you Lexi and Happy Thanksgiving!